You want a child who never makes you anything but proud? Please. Don’t bother if you can’t handle the fact that sometimes your child’s identity won’t be what you’d have chosen. And if you want to prevent your child from ever suffering? Well, then don’t have a child — no one avoids that. Childless adults may occasionally be asked (by relatives, potential mates, health care professionals, or the just-plain-impolite) if they want children and when it is they propose to get started. If you’re at that stage of your life and you haven’t committed yourself one way or another, here are some points, both pro and con, that you might wish to consider. Let me state my biases up front: the subject of whether or not to have children and how many is one I’ve have personally struggled with (and at various times I’ve been strongly on each side of this issue). At university, I objectively (and I thought prudently) decided to adopt any children I might have — the world was becoming overcrowded, a visit by my high-school ethics class to a local orphanage showed the seemingly-sterile environment those kids who weren’t adopted were consigned to, our neighbour across the street had just adopted an absolutely beautiful baby girl, and one of my high-school friends tragically died in childbirth. The party lasted until dawn, after which a group of us went to the local health clinic so Gary and I could get a blood test for STDs (required at that time and place to obtain a marriage licence). We were all a bit short of cash at that point, so we stopped off at a pawn shop on the way and I sold a gold coin taken from my favourite bracelet I was wearing to pay expenses. The blood tests we got showed we were clear, and before noon he and I found ourselves standing with our friends (our witnesses) before a justice of the peace exchanging our wedding vows (something like Britney Spears at her first wedding). Right before the ceremony Gary and I asked each other what our last names were so we could each fill out the required forms. None of this seemed real. That evening, I went to McDonalds to grab dinner and who should walk in but my new husband. He joined me, and afterward we went to his apartment to play poker with some of his friends. I ended up spending the night (we were married, after all). That should’ve been the end of it — I didn’t see him for the next several weeks — except that I discovered that I was pregnant. Wow. I thought the least I could do was to let him know. I privately hoped he’d offer to pay for the abortion that I unquestionably intended to get. Instead, he seemed deeply affected by the news and begged me to reconsider and have the child. He said we should give marriage a try until then and after the birth, if things didn’t seem to be working, we could put the baby up for adoption and resume our old lives. I dropped out of university, thus losing my all-expenses-paid National Merit Scholarship (no problem, they said they’d hold it open for two years and I could return when all this was over). My parents disowned me when I told them what I had done. I moved in with Gary (a photographer) and got a temporary job calling people on the phone urging them to vote for a particular candidate and could I mail them some literature? One day, a lady in the elevator told me she could tell that I was going to have a boy by the way I was carrying the baby. I told Gary, who was thrilled by the news and told all his friends. I stayed married to Gary for 5 years before we finally called it quits and got divorced. He never really bonded with Katy, and after the divorce, he never saw her (or me) again. I found I loved IT and, since I was now sole support for the two of us (Gary having dropped out of sight), I worked full time and didn’t return to university for several years (at which point I found I had lost my full scholarship, but by then my employer picked up the tab). Later, I remarried and had a son. One summer, Katy went to visit her grandmother from whom I had been completely estranged for years. While she was there, she accidentally died. No one even told me until after her funeral. I never saw any members of my extended family ever again after that. Meanwhile, I was devastated. I felt responsible. I shouldn’t have let her go. Feeling the lack of an extended family acutely (my husband’s family lived far away), I felt overwhelmingly that my son shouldn’t be an only child. The most important thing to me right then was to have another child. I got pregnant 5 times over the next 4 years (including two that were life-threatening and one that was twins) but I always miscarried. However, the 6th time worked. My second son was born on my first son’s birthday. I was so grateful to have them both that from that point forward, I totally devoted myself to motherhood. It’s widely known that when men retire, health suffers. Unless they feel strongly about something — a hobby, a charity, a part-time business, fishing, or the like, they often don’t thrive once they give up their jobs. Women face the same issues when the nest empties. It makes sense — a call to move on. But, male or female, the better you liked your job (even if that job was “mother”), the worse the pain of loss. Perhaps grandchildren will help! Why not put pressure on your children and their partners to produce grandchildren to fill that empty spot? Children are more expensive to raise than they ever were. Further, they once were valuable because they helped out on the farm or worked in the factory to help earn money for food from a young age. Though children may not produce much, they’re dirt cheap to hire. Mass education in public schools first disrupted this practice. Today, much of the value contributed by children is social: they make parents feel both needed and comparatively high in status. Some parents even treat their children as fashion accessories. Let’s Hope They Turn Out Attractive! Educated children cost more and demand more; an educated wife only makes them worse. Jobs for women mean less time for having young children and less interest, usually coinciding with the decades in which the women are most fertile. If they do have children, they often feel guilt for sometimes not “being there.” Accessing parental money by catering to (and creating, if necessary) the “needs” of children shorted quality time with parents remains a profitable business plan for advertisers. 1. The parents will be able to support all their children without ever relying on public assistance. 2. Upon reaching adulthood, the children will support themselves without relying on either parents or public assistance. Far from supporting their parents, an enormous proportion of adults end up relying on their parents into adulthood. Also, those children who you’re hoping will happily support you in your old age are probably going to be having children of their own so you’ll be competing with your grandchildren for your children’s resources — and who do you think should win that contest? That children should be stabilising to a marriage makes perfect evolutionary sense and one would assume hardly needs an explanation. Marriage is a union usually made for the express purpose of supporting common genetic interests; children are exactly the “marital capital” that would be expected to make both parents more willing to invest in the partnership. Divorce is less appealing to parents if for no other reason than that each would have a harder time finding a new mate given the financial, social, and physical toll children take on one’s subsequent mate value. In the 1960s, when legal marriage was still somewhat synonymous with lifetime partnership, having 1-2 children did, in fact, contribute to marital success. However, it didn’t prove to be the case with cohabitation relationships; having children actually strongly destabilises a “partner” relationship and this has now spilled over into modern marriages. For those married in the 1950s, each additional child was associated with a 16% reduction in divorce. In contrast, in 1990s marriages, each additional child was associated with a 37% increase in divorce. (Sons proved to be less destabilising than daughters for some reason.) Today, the birth of a child is associated with a sudden decrease in marital satisfaction that generally persists throughout the relationship. For Your Own Good — pregnancy can disfigure you, cause incontinence (sometimes permanently), depression, and some life-threatening illnesses. For the Good of the Father — he needs to be fully behind this as he will be socially and financially responsible for almost 2 decades for a child he may not wholeheartedly want. For the Good of the World — a billion people are hungry; animals go extinct because of insufficient habitat, our rubbish tips overfloweth. For the Good of Other Children — you could adopt an older or disabled child, you know. For the Good of Your Potential Child — if you’re depressed, have auto-immune problems, have heritable diseases in your family, if you aren’t completely committed and able (financially and emotionally) to parent a child for the next 2 decades, then reconsider. A child who is never born never suffers, feels rejected, or faces death. With new technology it may soon be possible to transfer an embryo from an unwilling womb to that of a desperately willing one. In fact, the unused, unwanted embryos from IVF techniques, which have not yet been implanted, are frequently adopted by, then implanted into, others. Pamela Root got the free flight and the voucher, plus an apology from Southwest, after her 2-year-old kept screaming those things at the top of his lungs as their San Jose-bound flight was about to take off. In fact, little Adam reportedly screamed so loudly that the safety announcements couldn’t be heard and the pilot turned the plane back to the gate in Amarillo, Texas, where the two were booted off. Unbelievably, Root demanded the apology she eventually got from the airline and hit it up for the cost of diapers and the portable crib she says she had to buy for the overnight stay. Even more unbelievably, there’s still no word of any apology from Root to the other passengers. Parents like Root and others who selfishly force the rest of us to pay the cost of their choices in life aren’t just bothering us, they’re stealing from us — our attention, our time, and our peace of mind. Overnight, “time outs” and “naughty corners” became both obsolete and ridiculous. “Eat your kale” is now met with “You eat my kale” or “I’ve decided to give up green vegetables”. I try insisting, but a teenager will quote the Convention on the Rights of the Child. I’m usually too tired to argue and, since no one is scared of me anymore, raising my voice just makes it seem like I’m the one having the tantrum. I have to constantly update my parenting techniques. Our kids are changing, nightly, by the glow of their computer screens, the click of a mouse, the tweet in the night, and we have to keep up if we want to stay in the game. There’s a Buddhist lesson about impermanence in there somewhere. Sometimes, when I see a mum cuddling her toddler in the park, I get that twisted-pretzel feeling under my ribs. I can’t remember when I last got some of that action. When Jordan was little, he’d catapult himself into the bath with me and natter about dinosaurs until his jaw cramped or the water got cold. Sometimes we’d have bubble-bath fights. But some time in his 9th year, he stopped. A year later, after a horrible day at school, I offered, “Bubble-bath fight?” He paused, frowning; I could almost see him weighing his thoughts. “Yes,” he finally said, “but make the most of it, Mum.” That was the last time. Since then, I’ve had to steel myself against an avalanche of tiny rejections. The other day I asked him if he wanted to go to the beach for a swim. He paused, I swear he paused, but then he let it out: “I don’t want to go to the beach … with you.” I could see how bad he felt about being this scalding. I pinched a smile together — “I get it, no problem” — and slunk off in search of the cat. Don’t judge me — a few pats and purrs can get a person through the day when that’s all the love on offer. What comes as a shock is the loss. It happens incrementally — the falling away of that world of unparalleled intimacy, of covering a little face with kisses. Of bedtime stories and “don’t-let-the-bugs-bite”, of the “World’s Best Mum” Mother’s Day cards when those words aren’t meant ironically. No one ever told me to prepare for a certain kind of grief as my kids outgrow Play-Doh and fluffy toys. So — there you go. Still want to be a parent? Whatever you choose, best of luck with that. but from him that hath not shall be taken even that which he hath. Self-perceived attractiveness shapes people’s perceptions of their social class, which in turn shapes how they respond to inequality and social hierarchies. Self-perceived attractiveness is associated with support for group-based dominance (“Having some groups on top really benefits everybody”) and a belief that it’s “natural” for some people to be “blessed” with more than others. Higher self-perceived attractiveness increases one’s self-perceived social class and that increases social dominance as a by-product, promoting an even stronger belief in the acceptability of inequality. Thus support is reduced for movements advocating for social equality. By contrast, lower self-perceived attractiveness led to a greater tendency to reject social hierarchies and to construe inequality as unfair. Attitudes about inequality affect how people approach important social issues, such as how public goods should be distributed, how much the wealthy should be taxed, and whether lucrative industries should be regulated. People spend staggering amounts of money and time to become more physically attractive. It isn’t just a cultural obsession, but a substantially important attribute by which the social hierarchy is fundamentally organised. How Much Brain Is Really Necessary? The peregrine falcon reaches faster speeds than any other animal on the planet when performing a stoop, which involves soaring to a great height and then diving steeply at speeds of over 320 kilometres per hour (200 miles per hour), hitting only the wing of its prey so as to minimise harm to itself on impact. Air pressure from such a dive could damage its lungs, but bony tubercles on the nostrils guide airflow to each side, enabling the bird to more easily breathe and dive at the same time. A study testing the flight physics of an “ideal falcon” found it had a theoretical speed limit of 625 kilometres per hour (390 miles per hour) for high altitude flight (so some falcons may be underperforming). But they’re good enough that the B-2 Spirit Stealth Bomber appears to have been modelled after them. The original B-2 design had had tanks for a contrail-inhibiting chemical, but this was replaced in production aircraft by contrail sensors that can just advise the crew when to change altitude. Some include an upward-facing light sensor which advises the crew when to change altitude based on sky luminance. To reduce optical visibility during daylight operations, the B-2 is painted in anti-reflective paint, undersides dark because at the 50,000-foot altitudes where it flies, a dark grey paint more easily blends into the sky. Unfortunately, the B-2 is vulnerable to being visually intercepted by fighter jets under 20 nautical miles (37 kilometres). A man with an unusually small brain managed to live an entirely normal life despite his condition, thought to have been caused by a fluid buildup in his skull. Scans of the 44-year-old man’s brain showed a huge fluid-filled chamber called a ventricle, which took up most of the room in his skull and leaving little more than a thin sheet of actual brain tissue. He was a married father of 2 children and worked as a civil servant. He had gone to a hospital after experiencing mild weakness in his left leg. When neurologist Lionel Feuillet’s staff took his medical history, they learned he’d had a shunt inserted into his head as an infant to drain away hydrocephalus (water on the brain). The shunt was removed at age 14. Computed tomography (CT) and magnetic resonance imaging (MRI) scans showed “massive enlargement” of the lateral ventricles, the (usually tiny) cerebrospinal-fluid-holding chambers that replenish the brain’s equivalent to vehicular airbags. Intelligence tests showed the man had an IQ of 75 (below average, but not considered mentally retarded or disabled). His whole brain was reduced — frontal, parietal, temporal and occipital lobes — on both sides. These regions control motion, sensibility, language, vision, audition, and emotional and cognitive functions. Occasionally, someone walks into a hospital and gets a brain scan that unexpectedly reveals startling differences from those around us that we can have inside our heads. Luckily, the important functions our brain carries out are not farmed out to single distinct brain regions, but instead supported by multiple regions, often in similar but slightly different ways. If one structure breaks down, others pick up the slack. Nobody realises that some people expend tremendous energy merely to be normal. A Message from the POTUS? The old adage that time is like a river suggests that we move through it like a ship sailing on water. This may be wrong according to Dr Bradford Skow, associated professor of philosophy at Massachusetts Institute of Technology (MIT). He posits that time doesn’t move forward, but rather, everything in time is ever-present. According to his theory, if we were to look down upon the universe, we’d see time spread out in all directions, just as we see space at the moment. His theory known as the “block universe” states that the past, present and future already exist — you’re spread out in time, something like the way you spread out in space. [Would this mean the universe is deterministic? Or do all possibilities exist at once?] Dr Skow says that time travel between the different times would not be possible. A Markov chain (see here for a detailed explanation), named after Andrey Markov, is a mathematical system that randomises input based on statistics. Usually characterised as “memoryless”, meaning the next state depends only on the current state and not on the sequence of events that preceded it. This specific kind of memorylessness is called the Markov property. One example (explains how Garkov works in detail) of Markov chains in action is Garkov, where the long-running Garfield cartoon strip meets Markov chains. But Markov methods are only as good as their input corpus. Input a lot of the same words, or random gibberish, and that’s what you’ll get back. Broadly, there are two types of planet in the universe — terrestrial, rocky worlds like Earth, and gas giants like Neptune. Can (some) gas giants transform into rocky worlds later in their lives (thus maybe becoming habitable)? If so, life may have even more chances to thrive in the universe than previously thought. Researchers studied what they call mini-Neptunes (about 10 times Earth’s mass), which sometimes migrate closer to their hosts. In these systems, they form far from their host star when ice molecules join hydrogen and helium gases in great quantities to form icy rocky cores surrounded by massive gaseous atmospheres. Initially too cold to be inhospitable, tidal forces from the system’s star can cause it to migrate closer to the system’s centre. This subjects them to more X-rays and radiation, causing some of their gaseous atmosphere to be ejected into space. Such a planet is likely to have abundant surface water, since its core is rich in water ice, which can melt to form oceans harbouring life. And they may even become habitable for humans according to a study focussing on gaseous planets around M Dwarfs (stars smaller and dimmer than our sun) with close-in habitable zones. One system’s parent star, Kepler-444, is 117 light years from Earth and 11.2 billion years old (see here for the journal article). When the sun-like star formed out of a primordial cloud of gas and dust, the universe was just 1/5 of its current age. The system hosts 5 planets with diameters ranging between those of Mercury and Venus. That makes them roughly the same size, or slightly smaller than Earth. Astronomers expect to find many earth-like and super-earth planets in the habitable zones of such stars in coming years, so it’s important to know on which ones we should focus more attention. Walking on the moon has become commonplace. When small and medium-sized stars die, they don’t explode like their larger counterparts. Instead, they peacefully puff up, releasing outer layers into the surrounding space and creating beautifully-shaped clouds. This white dwarf is called Jupiter’s Ghost; it’s located about 3,000 light-years away and is an example of outer layer shedding. The blue glow filling the inner bubble represents X-ray emission from hot gas heated to 2,000,000 degrees. This same thing will happen to our own sun after its hydrogen is consumed beginning about 7 billion years from now. Jupiter’s Ghost was named after the planet Jupiter in our own solar system because this star appears to take up about the same amount of space in the sky as our gas giant does. The star will slowly cool to background temperature and become invisible. A precocious child might write his or her full address as Main Street, Toronto, Canada, the Earth, the Solar System, Orion Arm, the Milky Way, the Local Group, the Virgo Supercluster, the Universe. Sculptress Kendra Haste, graduate of the Royal College of Arts, works with the medium of galvanised wire. Public sculptures in the United Kingdom include an elephant at Waterloo Station, London and 13 works at the Tower of London commissioned by Historic Royal Palaces in 2010. A part of this group, the baboon sculpture is for sale. I don’t know the exact figure, but her work is normally priced from £3,000 to over £50,000. This steel armature and painted galvanised wire grouping is displayed at the Tower of London due to an Historic Royal Palaces Commission in 2010. The sculptress says she tries to capture the spirit and character of the individual creatures. Kendra Haste has been represented by Patrick Davies since 1998 and together they develop commissions, projects, exhibitions, and other initiatives. Sherman showed up at the Humane Society Silicon Valley recently. Being male, he’s a very rare calico cat as there’s less than 0.1% chance of a calico being male. Male calicos suffer from Klinefelter’s syndrome, which means they are always sterile and usually have a lot of health problems ranging from brain damage to genital deformities and organ failure. But they’re supposed to bring good fortune. In addition to snowy owls, there are also short-eared owls at Boundary Bay, and plenty of harrier hawks. These two didn’t like each other very much and were constantly trying to steal each other’s lunch — in this case, a vole. The harrier attacked the owl in mid-air and the battle was on. The owl came out on top and was able to retain the right to a hard-fought meal. Cockroaches are ugly and among the most loathed of creatures — yet they’re individuals, each having a personality. Researchers studying the behaviour of these insects have discovered that far from simply being a homogeneous mass they have individual character traits, with some shy (keeping hidden as much as possible and seeking the safety of shelter) while others are more adventurous (keen to explore their surroundings). Different personalities are thought to help species to survive — different behaviours increase the chances of at least some surviving when disaster strikes. The personalities of individuals can also affect group behaviour. In their natural environment the adventurous cockroaches find extra food but simultaneously increase their exposure to predators. For the experiments researchers attached radio tags to American cockroaches, Periplaneta americana, to monitor movements. These were kept in darkness during the experiments and released in batches of 16 in arenas surrounded by electrified wires to prevent escape. A new study has found that memory has to be mentally set to “record” in order to remember certain information. When not expecting to be tested, people forget information about one second after paying attention to it. But, when they expect to be tested, recall is doubled or even tripled. One hundred people were shown sequences of numbers and letters and told they’d be tested on the position of the letters. People performed very well on this task, rarely making mistakes. But when the task was tweaked slightly — when participants were unexpectedly asked whether they had seen certainly letters previously rather than about their positions, they performed poorly — they remembered the positions of the letters, but apparently not what the letters actually were. Once people realised the test had changed, performance began to improve dramatically — with up to 95% correct soon being recorded. This implies that important memories — ones we’re more likely to need and use — will be more strongly encoded in memory. Lots of things matter where your job satisfaction, earning power, and the success of your career are concerned. Your boss matters. So does your education, the industry you’ve chosen, and macroeconomics. And luck. Luck definitely plays a part. But while those are all recognised important factors in your career and your earning power one you may not have considered is your spouse. People with relatively prudent and reliable partners tend to perform better at work, earning more promotions, making more money, and feeling more satisfied with their jobs. That’s true for both men and women. “Partner conscientiousness” predicts future job satisfaction, income, and likelihood of promotion (even after factoring in the participants’ level of conscientiousness) for both sexes. “Conscientious” partners perform more household tasks, exhibit more pragmatic behaviours that their spouses are likely to emulate, and promote a more satisfying home life, all of which enables the spouse to focus more on work. Some people say that we’re the average of the 5 people we spend the most time with — particularly true where our significant others are concerned. If one person is extremely organised and keeps the household trains running on time that frees the other to focus more on work. And since the best way to lead is by example, in time you may find that you and your significant other make a great, mutually supportive team, each of you genuinely and actively supporting the other’s goals and dreams. Stepping on the scale is common among dieters but how does the frequency of weigh-ins impact weight? A new study shows that the more frequently dieters weigh themselves the more weight they lose, and if participants go more than a week without weighing themselves, they gain weight. Weight naturally fluctuates throughout the week and most people weigh the least on Wednesdays, so you should at least weigh yourself on that day. The most recent Oxfam International report called “Political Capture and Economic Inequality” concludes that almost half of the world’s wealth is now owned by just 1% of the population, and 7 of 10 people live in countries where economic inequality has increased in the last 3 decades. The World Economic Forum has identified economic inequality as a major risk to human progress, impacting social stability on a global scale. A massive concentration of economic resources in the hands of fewer people presents a threat to inclusive political and economic systems, and compounds other inequalities such as those between women and men. Left unchecked, political institutions are undermined and governments overwhelmingly serve the interests of economic elites to the detriment of ordinary people. The World Economic Forum ranks “severe income inequality” as amongst the top 5 most significant risks facing the world. The increasingly-unpopular French President Hollande slapped a 75% tax on anyone with a salary of over one million euros (approximately US$1.37 million) as a Christmas holiday gift to the poor. The result? A massive exodus of wealthy French declaring residency in Belgium or Luxembourg. In developed economies, the middle- and lower-middle classes are slipping towards the bottom as education becomes more expensive, credit more difficult to obtain, and well-paying jobs scarcer. Perhaps income inequality is just a natural inevitable by-product of efficient free markets? Whatever the cause, there’s no easy fix. A debate rages as to whether this can be managed better under democracies and free markets or under more autocratic governments with more central planned economies. Many thought that social media would be a game changer but to date, it has served merely to better inform the underprivileged in HD colour just how wide the income inequality chasm really is. These “sleeping cabins” called Napcabs are located in the middle of the airport terminal; the tiny private rooms, fully decked out with luggage storage, bed and small workspace can be rented via a swipe of a credit card at rates of $12-$18 an hour ($35 minimum). You get 4 square metres of space, Internet access, bed linens, an iPod dock, music, and videos. There’s even an alarm clock. So far, Napcabs are available only in Munich but Japan has a similar offering called 9-Hour Capsule Hotel, which provides individual pod-like sleeping spaces, luggage-storage lockers, high-speed Wi-Fi, high-end bath products and Egyptian cotton towels for the shared shower and lounge facilities all in a pre-security area. Men and women sleep in separate areas, in doorless pods that are 43 inches wide, 86 inches deep and 43 inches tall. Prices start about $39 for one night and $15 for one hour if you’re in need of a nap. Another offering, Podtime, has personal sleeping pods that may soon appear in a terminal near you (not quite there yet). Podtime’s Podtels have LED lights, a mirror, privacy blinds and a lockable luggage space underneath. Two of them can stack up to make a pod bunk, ladder and all. Optional extras include lockable door with a high-tech card entry system, memory foam mattresses, shelving, tv and walls with adjustable translucency. Yotel, a no-frills hotel chain now in London’s Heathrow and Gatwick airports and in Amsterdam’s Schiphol airport. Yotel’s rooms are 75 square feet, with just enough room for a bed, desk, and shower. A 4-hour block of time costs about $45, and an overnight stay about $90. There is now one near Times Square in NYC. The 167-square-foot rooms have self-service check-in and a wide variety of high-tech amenities including an automated Yobot that will take your bags and store them out of the way. Prices for a basic room start at US$149. These include Wi-Fi, workstations, moving beds that fold part-way so they can double as seating areas, techno-walls with flat-screen tv, power outlets, music players, and a complimentary breakfast. This window isn’t a window — it’s a fake skylight that realistically mimics the summer sun — but it’ll set you back £40,000 ($61,000) plus £5,000 ($7,600) for installation. By Coelux, the aperture mimics the visual appearance of the sun and sky by using a solid layer of nanoparticles that produce Rayleigh scattering. Rayleigh scattering is what causes the sky to appear blue. It can specifically mimic the brightness and quality of light from the tropics, the Mediterranean and from northern Europe. For example, CoeLux 60 produces cooler vertical rays with the maximum luminance contrast of light and shadow, as seen in tropical regions. The Mediterranean-based CoeLux 45 skylight features a 45° ceiling beam that offers an equal balance of light and shade. While CoeLux 30 uses a 30° angle beam relative to the horizon to reproduce a warm, Nordic grazing light. The layer inside each artificial skylight also creates an illusion of depth to make the sun appear to be far away. CoeLux was set up by researchers from Italy’s University of Insubria. Mount Aspiring / Tititea is New Zealand’s highest mountain outside the Aoraki/Mount Cook region. Set within Otago’s Mount Aspiring National Park, it has a height of 3,033 metres (9,950 feet). The Māori named it Tititea, which translates to Glistening Peak. It’s also often called “the Matterhorn of the South” for its pyramidal peak when seen from the Dart River. It sits slightly to the west of the main divide, 30 kilometres west of Lake Wanaka. This is Lake Rotoiti, Nelson Lakes, at sunrise. Lake Rotoiti is in the Tasman Region of New Zealand, a substantial mountain lake within the borders of Nelson Lakes National Park. Fed by the Travers River, water from the lake flows into the Buller River; surrounded by beech forest, it’s 82 metres deep and stocked with trout. Saint Arnaud is the small community at the northern end of the lake. The lake is a popular place for waterskiing and is surrounded by tramping tracks. Lake Wanaka is located in the Otago region of New Zealand, at an altitude of 300 metres. Covering an area of 192 square kilometres (74 square miles), it’s NZ’s 4th largest lake, estimated to be more than 300 metres (980 feet) deep. Its name is Māori, a corruption of Oanaka ('The place of Anaka’, a local tribal chief). Wanaka is a town on the lake with which it shares its name. The lake is 42 kilometres long and its widest point at the southern end is 10 kilometres. The lake’s western shore is lined with high peaks rising to over 2,000 metres above sea level. Along the eastern shore the land is also mountainous, but the peaks on that side are somewhat lower. This photo was taken from Roys Peak — a hard walk but well worth it. Oxygen weed (Lagarosiphon major), an aquarium plant and invasive species native to Southern Africa, has been a problem in the lake’s ecosystem for some time. Attempts to eradicate it have been unsuccessful. Substantial suction dredging operations have shown promise, but tend to miss isolated spots which then regrow into larger weed beds. The 19th-century premier Sir Julius Vogel wrote a novel in 1889 predicting New Zealand life in the year 2000. His predictions included a federated Europe, moves towards Australian republicanism, a British monarch marrying a charismatic commoner, aluminium “air cruisers”, a news media dominated by celebrity gossip, labour-saving domestic appliances, air conditioning and electric lighting. He tipped that while tourism, fishing and agriculture would fuel the economy, this country would also be a world-class wine producer. On other predictions, Vogel was almost right. Mobile phones? Read about his “hand telegraphs”. But we have yet to see his imagined female US president. How difficult is it to predict the future? Think of a sentence which we now can easily understand: “Cyber-commuting has become easier since the rollout of universal high-speed broadband.” It would’ve been meaningless to even a technically-minded person in 1975. Professional photographer Elke Vogelsang lives in Hildesheim, Germany. She takes intimate and playful portraits of her 3 dogs. Her photos portray them with grace, personality and humour. This encounter is occurring at the “Russia’s Grizzly Coast” exhibit at the Minneapolis Zoo in the US. Grizzly bears can weigh up to 1,300 pounds and can grow to be 10 feet tall. They have razor-sharp claws and could easily kill a human being. Roseate spoonbills are among the most striking birds found in North America; they are members of the ibis family. Even riding camels in Broome, Australia, the NSA still knows where you are and what you’re thinking. West Springfield, Massachusetts is where where pigs can fly. This photo was used in an ad for Pfizer Animal Health with a slugline “We make breathing the easiest thing on Earth” and they claim to have the widest range of products against swine respiratory diseases. A sybaritic pig watches the world go by because he knows that life is all about attitude. Traffic jams the streets of Xi’an, China in heavy smog after the traffic lights failed. When a traffic jam becomes so extreme that it snarls the entire road system, then gridlock such as this results. Notice that one side of each road (the side leading away from the jam) is completely free from traffic. Street lamps light a path through a dense population of small homes with mostly red roofs in Larung Gar, in the Garzé Tibetan Autonomous Prefecture, China. Some 10,000 nuns and monks live here, settled around one of the largest Buddhist institutes in the world. Life for the poor is not easy, especially in Hong Kong where coming home means paying HK$1,500 (£117) per month to live in one of a dozen wire cages tucked into a single crumbling apartment. Some 100,000 people live in what “inadequate housing” is officially called. The poorest of Hong Kong’s citizens live in these cage homes that are steel mesh box constructions stacked atop each other. The division between poor and rich is stark in the former British colony. Cages measure 6 feet long and about 3 feet wide. A small one-bedroom apartment would cost about HK$16,000 (£1,240) a month (more than 10 times as much). My guess? It looks better than it tastes. Printed by the Chefjet Pro. Full-colour cocktail decorations, architectural cake supports, interlocking candies, beautiful sugar sculptures — they’re all possible. J J Thomson won the Nobel Prize in Physics in 1906, when he showed that electrons were particles. J J Thomson’s son, George Paget Thomson, won the Nobel Prize in 1937, when he showed that electrons were waves. Bromo Tengger Semeru National Park is located in East Java, Indonesia, to the southeast of Surabaya, East Java’s capital. In the caldera of an ancient volcano (Tengger), new volcanic cones have emerged. This unique feature covers 5,250 hectares at an altitude of 2,100 metres; the area has 4 lakes and 50 rivers. Cemoro Lawang is a small hamlet northeast of Mount Bromo (a still-active volcano). Further south in the national park, there’s another volcanic complex called the Semeru Group that includes the highest mountain in Java, Mount Semeru (3,676 metres). The Semeru forest area has many rivers that are former lava lines. The area in and around the park is inhabited by the Tengger people, one of the few significant Hindu communities remaining on the island of Java, believed to be descendents of the Majapahit empire, who were driven into the hills after the mass arrival in the area of Muslims in the 19th century. Monemvasia is a town and a municipality in Laconia, Greece. The town is located on a small island off the east coast of the Peloponnese. The island is linked to the mainland by a short causeway 200 metres in length that was built in 1971. Its area consists mostly of a large plateau some 100 metres above sea level, up to 300 metres wide and 1 kilometre long, the site of a powerful medieval fortress. The town walls and many Byzantine churches remain from the medieval period. The town’s name derives from two Greek words, mone and emvasia, meaning “single entrance”. Its nickname is the Gibraltar of the East or The Rock. The town and fortress were founded in 583 by inhabitants of the mainland seeking refuge. Only about a dozen people live year-around in Monemvasia’s old city today, compared with perhaps thousands during its 12th-century heyday. Toroweap Overlook: that shiny ribbon is the Colorado River. Built in the small village of Deulino, Ryazansky District, Ryazan Oblast, Russia, each elements of this unique steampunk train barbecue grill was carefully designed to effect a genuine ancient train look. The 4-ton BBQ locomotive has 3 working bays: 2 adjustable up to 60 centimetres in the main body and one in the trailer that contains the implements for the stove. The furnace is lined with refractory fire-clay brick. The first compartment is designed for cooking kebabs and can hold up to 20 skewers upright. The second compartment has a rotating spit for roasting. The mechanism is operated from the cabin through a “steering wheel” that can distract guests’ children for a while. The steam engine consumes charcoal or preferably (according to its developers) birch or oak logs (for their aromas that flavour the food). Firefighters are there for you even in 2D. Once he reaches the sunset, will he continue on from there? This is a Normandie landscape that’s about to get very wet. I found this photo on several sites and in various colours, more than one of which claimed to be its creator. I suspect it’s digital rather than a photo, but I don’t know that for certain. It’s been turned into wallpaper, making it doubly difficult to track its origin. Pixel is a dance show for 11 dancers in a virtual and living visual environment. It uses illusion to combine energy and poetry, fiction and technical achievement, hip hop and circus. The screen snap doesn’t do it justice — I watched it 3 times (it’s only 3 minutes long). This is the software they used, which they developed themselves. SAM3 is an artist that paints big as well as small shadows and silhouettes in his urban surroundings that are sometimes ironic, other times poetic. Born in Elche, Spain, SAM3 currently lives and works in Madrid. His large street murals are hard to miss and are widely scattered. Let the software install wizard jokes fly: Gandalf, played by Ian McKellen, uses his MacBook Pro while taking a break during filming of The Hobbit in New Zealand. The Scarborough family portrait by commercial photographer Rich Johnson was done with a sound trigger and a shutter speed of 1/1000 of a second. The sound triggered the camera at 150th of a second after the water balloon popped. The only Photoshop was putting all of them together and swapping a face or two in from a different run-through due to closed eyes but a better splash pattern. O’Connell was late for a meeting and in a panic as he looked for a parking spot. Just then, out of nowhere, a parking spot appeared in front of him. 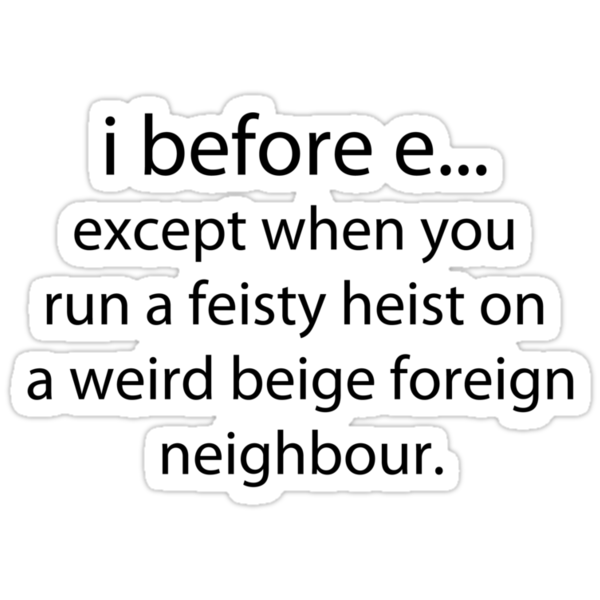 except when you’re running a feisty heist on a weird beige foreign neighbour. What’s the difference between yoghurt and Australia? We have three cats. It’s like having children, but there’s no tuition involved.